Lefevre Cranstone | The Dacorum Heritage Trust Ltd.
DACHT : 778.1 Photograph of a painting by Lefevre Cranstone. 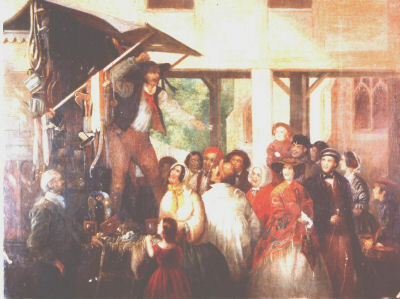 It shows market traders outside the old Market House in the early 1800s. The couple in the right foreground with the stick and umbrella are his brother, Edmund Cranstone and his wife. DACHT : 932.248 Slide of ‘Colonial Williamsburg. 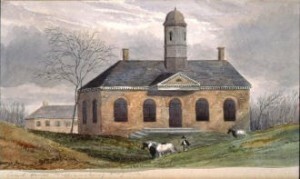 The Court House of 1770 ‘ Watercolour by Lefevre Cranstone. DACHT : 932.814 Slide of a wash on paper by Lefevre Cranstone of “The Kangaroo” boat. 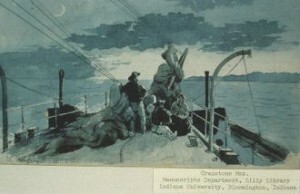 This was the boat in which he travelled to America in 1859. DACHT : 932.817 Slide of a painting of The White House, USA by Lefevre Cranstone in 1860. Lefevre James Cranstone was born in Hemel Hempstead in 1822. He developed an interest in art from an early age and was enrolled at Henry Sass’ School of Art in 1838 before entering the Royal Academy School as a probationer in 1840. Lefevre is perhaps best known abroad, particularly in the USA. 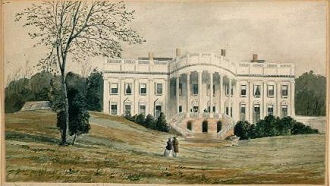 The reason for this is that he visited America in 1859 producing over 300 sketches. Today, many of Lefevre’s works are in notable American institutions such as the Museum of Fine Arts (Boston), the White House (Washington DC) and The Lily Library (Indiana University). Lefevre is not only of interest as a fine Victorian artist, but also as a member of a notable local family. The Cranstone’s were influential within the political, religious and industrial spheres of Hemel Hempstead, running the iron foundry in the High Street and holding prominent positions in the town’s Society of Friends (Quakers). The final decade of his life was spent in Australia, where he moved following the death of his wife, Lilia, in 1882. The warmth and light appears to have rejuvenated his artistic verve. He died in Brisbane in 1893, aged 71.